THE EPO is already being destroyed by a patent maximalist called Battistelli. The USPTO dodged the bullet when years ago it decided to improve rather than worsen patent quality. Pressure groups like AIPLA aren’t happy about it [1, 2, 3]; they’re adamantly against Section 101, AIA (IPRs/PTAB) and many other things. The same goes for opportunists like Anticipat, who as recently as yesterday promoted a so-called ‘webinar’ — a euphemism for lobbying — with AIPLA in it (Patent Docs promotes similar events). New USPTO Director Andrei Iancu has called for greater predictability in the US patent system and has admitted that there is a perception problem with the Patent Trial and Appeal Board (PTAB) among the IP community. In his first interview with a specialist IP title since he took office in February, Iancu covered a wide range of topics including the need for greater guidance over patent eligible subject matter and concerns around the PTAB, but he consistently returned to the subject of predictability in a sign of what could become the defining feature of his time leading the agency. That should provide some comfort for patent owners who have complained of the uncertainty in the system fuelled by the rise of inter partes reviews (IPRs) and a lack of clarity over Section 101 of the US patent statute. 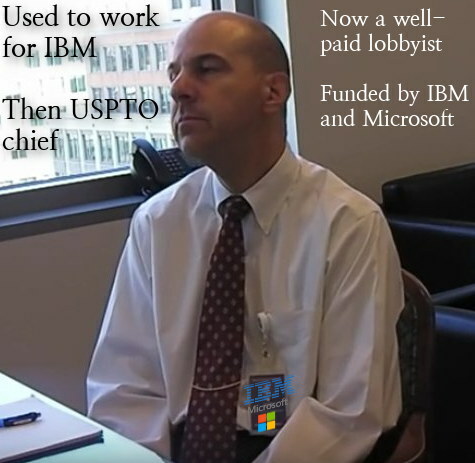 Remember that IAM is giving honours to scammers who combat PTAB. IAM is far from an objective observer; it’s a front group masquerading as a publisher/media.